La Piadina is a wonderful thing. What it is IS an Italian flatbread made of flour, lard (or olive oil), salt and water and stuffed with 2-3 ingredients- usually a meat, cheese and a veg. In Emilia Romagna, where la piadina romagnola originates, you will find piadinerie that make the flatbread fresh (even with little charred blots on) and stuff it with local cheeses, prosciutto and fancy sauces (truffle cream upon request!!!). What I love about piadine is that they are EASY. And if you have the right tastes and imagination- they make the best dinner finger food ever. In the summer, I love playing around with fruit in savory meals. And the one you see above is filled with: late summer figs, prosciutto cotto (divine and silky), BURRATA (mozzarella in crack form), black truffle salsa and grilled eggplant. Not pictured: drizzled aged balsamic. piadina flatbread…store-bought, bakery made or home-made with a recipe. Fold. Slice as you would a quesadilla and devour! A Sémillion (French), Sauvignon Blanc (Tuscan or Tyrollean) or some sort of rich french-style white would be perfect to hold up to all the fat and umami. A red would steal the spotlight. 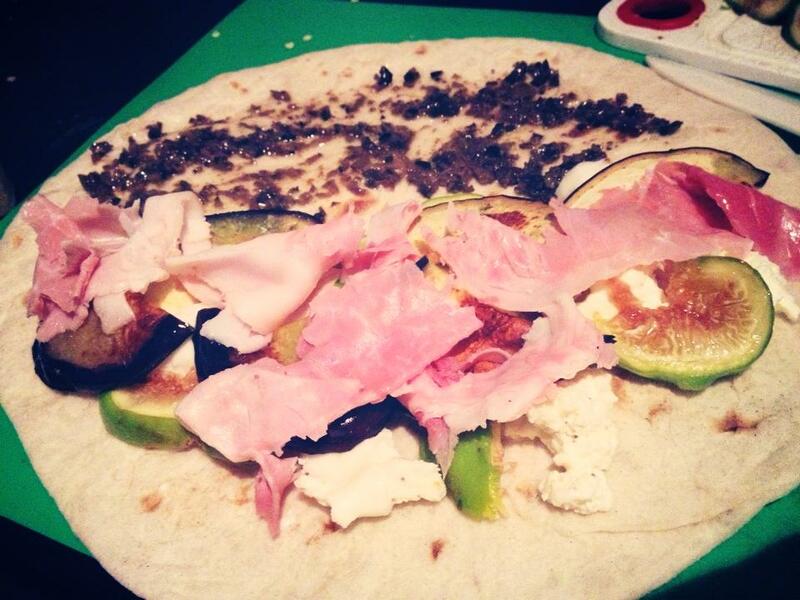 The exact wine paired with this piadina was: Podere Sassaia by Petreto in Tuscany. Curious Appetite is a food blog by writer and sommelier Coral Sisk. I blog about eating & drinking well in Florence, Italy & wherever curiosity takes me. I packed up to Florence via Seattle in 2012 to pursue a career in food & wine. Outside the blog, I lead culinary tours & write for trusted publications such as Eater, Vogue, The Guardian and others. My favorite food groups are pasta, gelato and cocktails. What about yours? Click to "Subscribe now" and receive updates- always and never served with spam. Back in Florence, Best Bars and Conde Nast Traveler Clips!